How can you teach a child to love reading? Pictures,” a ridiculously delightful children’s book designed to win over the most skeptical listener and to prove that even books with no pictures have something to offer kids. This is not a traditional story book. 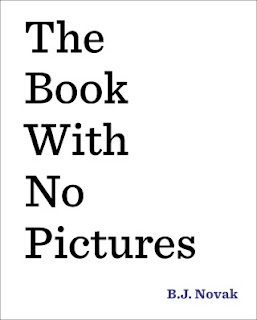 Instead, “The Book With No Pictures” is an exploration of silly sounds and funny words that will have listeners (and possibly readers as well) laughing out loud. It’s proof, for children and adults alike, that language is fun, books are full of surprises and even grown-ups can be silly. Parents and loved ones, be warned: Reading this book out loud, as it’s intended to be read, will force you to say things like, “I eat ants for breakfast,” and “I am a robot monkey.” But your children will be laughing so loudly, you may not even be able to hear yourself. “The Book With No Pictures” appeals to a wide variety of ages. Smaller children will be delighted by the surprises and older children will still get a kick out of hearing an adult say, “Brrrrooooggg!” They may even force visitors to read this book out loud, or take it to school to share with their teacher. In short, this may be one of the first books your child loves. 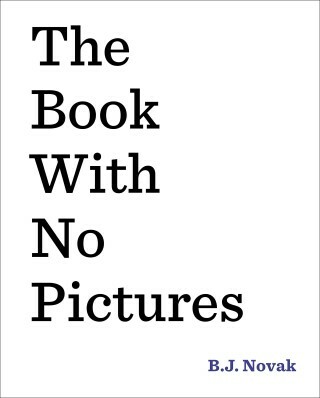 You can check out a copy of “The Book With No Pictures” at the Raymond Village Library.